Massachusetts-based Paul and Judy Jusseaume hired Richard Moody and Sons to build this modified Cape near the beach in Wells. The highly detailed home has a bluestone walkway with a partial stone-veneer facade that echoes the yard’s stone wall. The exterior windows are black and include custom hexagonal mullions. Behind the house is the Rachel Carson National Wildlife Refuge. 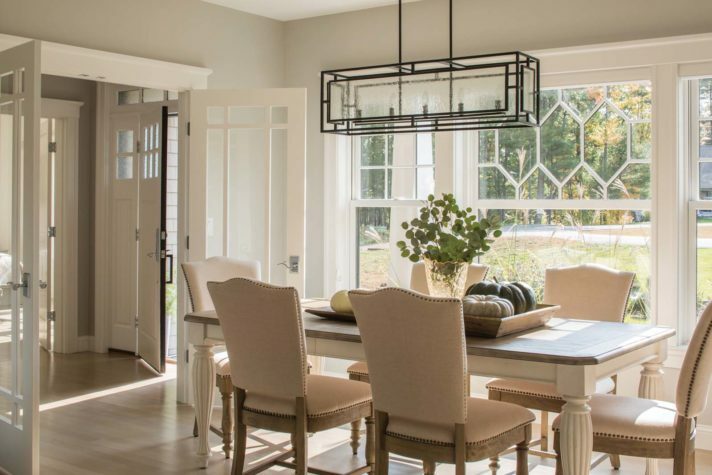 The dining room has beach-inspired furniture, detailed trim work, and a rectangular chandelier from the Lighthouse in Kennebunk. In the owners’ bedroom, the trim, beadboard, and ceiling are painted white. The furniture is from Jordan’s Furniture, and the bedding gets an occasional do-over, thanks to trips to Bed Bath and Beyond. The sandpipers echo whimsical decorations throughout the house. The custom mullions (shown in the small windows here) appear throughout the house, as do the floors stained a custom gray to suggest driftwood. Karen Alcorn at Home Again by Hancock Lumber designed the bathrooms and kitchen. Here, she used an extended island so the whole family can gather. The top tier is Cambria, and the lower is walnut. Adding visual contrast are the backsplash tiles from Blue Rock of Maine that run in two different directions and the gray stove hood and drawers. The inset panel cabinetry is beadboard. 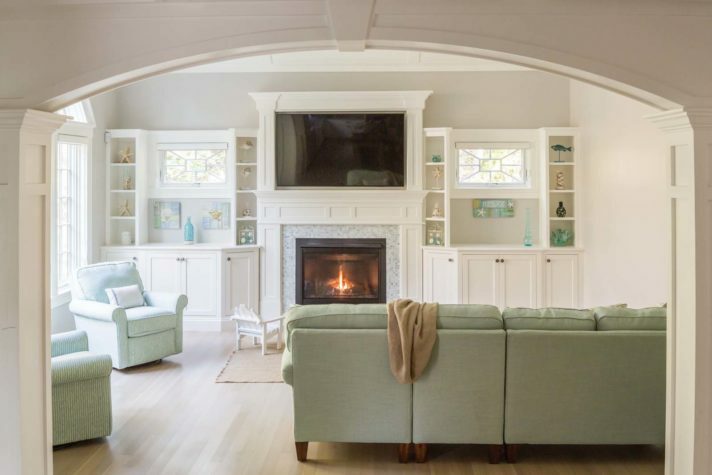 An arch between the kitchen and living room replicates an arch over a window to the left that overlooks the Rachel Carson National Wildlife Refuge. Small, square marble tiles from Blue Rock of Maine form the fireplace surround. 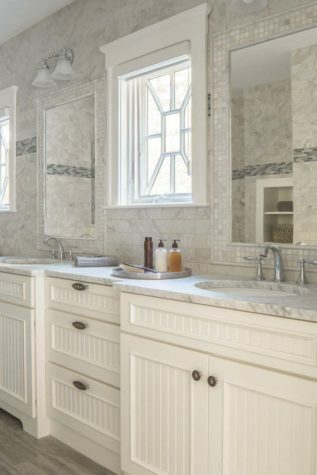 In the owners’ bathroom, Alcorn stepped the cabinet back and pulled the sinks forward. The faucets are from Kohler’s Finial collection and were supplied by Spritzo and Splash. The house has gable detailing and a flared column at the entryway. For the bulk of their professional lives, Paul and Judy Jusseaume owned an ambulance service in Marlborough, Massachusetts. They were accustomed to the stress that comes with a fraught, 24/7 job devoted to emergencies. Judy was all the more accustomed, because she grew up around the business, her father having started it. For more than a decade in the early 2000s, Paul and Judy had a home in Ogunquit where they came to relax on weekends. “We’d drive over the bridge into Maine,” says Judy, “and all our stress would go away.” By the time Paul and Judy retired, their two children were grown and had children of their own. The extended family still treasured the pleasures of the Ogunquit home but longed for more bedrooms and space. As fate would have it, the lot the Jusseaumes had was in Moody, a village within Wells, where Josh’s great-grandfather used to run the area’s general store and post office. He had been a builder and farmer as well. “Back then, everyone did everything,” Josh says. The Jusseaumes loved the coastal homes with intricate finish detailing that Moody and Sons is known for. 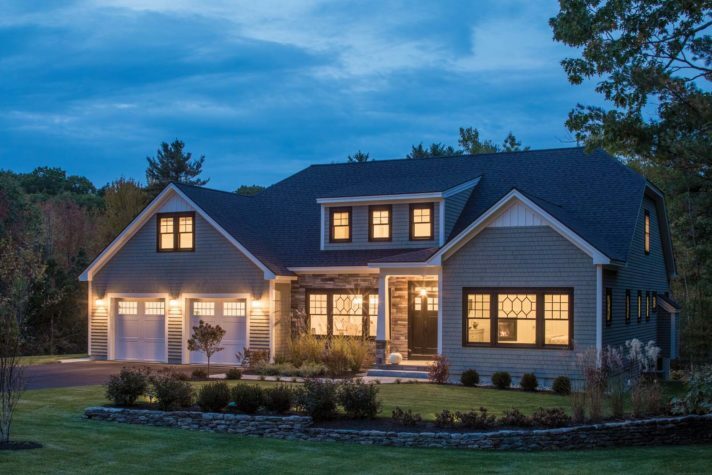 They picked favorite features from previous houses that Moody had built, employing Tom Bouchard of Wells as their architectural designer. 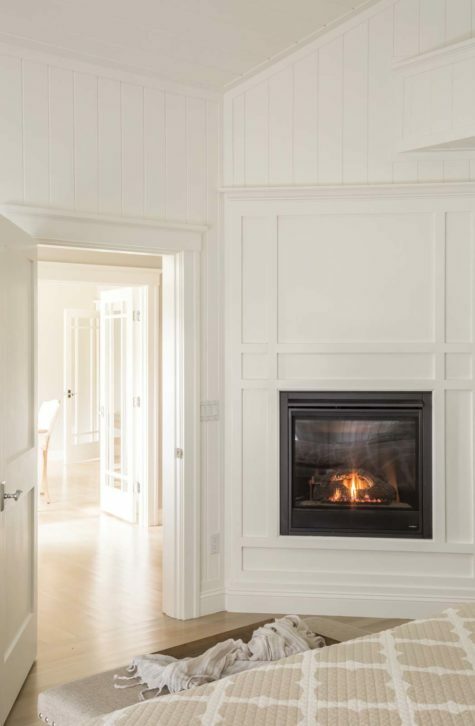 In the end, they incorporated extensive trim, wall paneling, beadboard, coffered ceilings, and archways, as well as custom built-ins. The house is partially open-concept, with a very large kitchen separated by an arch from a vaulted living room, but the dining room and ground-floor owners’ bedroom are two distinct rooms off the foyer. There is also a children’s TV room, or “quiet” room, off the mudroom. Judy and Paul have five grandchildren, four girls and one boy. The girls who were old enough to have an opinion selected the colors of two of the upstairs children’s bedrooms; one has pink walls, the other has purple. The boy selected the color of an extra room above the garage (which has more beds, including a child’s bed in the shape of a boat and a crib for the newest grandchild). The children’s bedrooms share a large bath, while an additional bedroom for adult guests has a private bath with a pocket door. The interior aesthetic is beach inspired. The floors are quarter-sawn white oak with a custom gray finish, a treatment that suggests driftwood. Judy wanted gray and white as the dominant palette for the ground floor, so the walls are gray while the trim and detailing are white. These neutrals are purposefully peaceful and subtle. When color is introduced, it is largely restrained, such as the light mint green on the furnishings in the living room and the pale blues and tans of the pillows and linens in the owners’ bedroom. (“She changes the colors every three or four months,” Paul says, apparently teasing, but then Judy admits this is true. Still, she says, she thinks she will stick with what she has for now.) 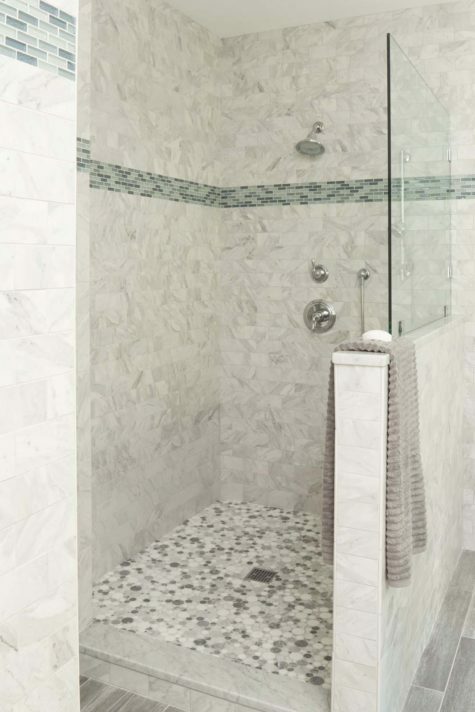 Marble appears in the house, sometimes in unexpected places (such as the small square tiles on the living room’s fireplace surround) and sometimes in unexpected combinations, as in the owners’ bathroom, which has subway, square, and mosaic tiles, plus bubble-shaped tiles on the shower floor. 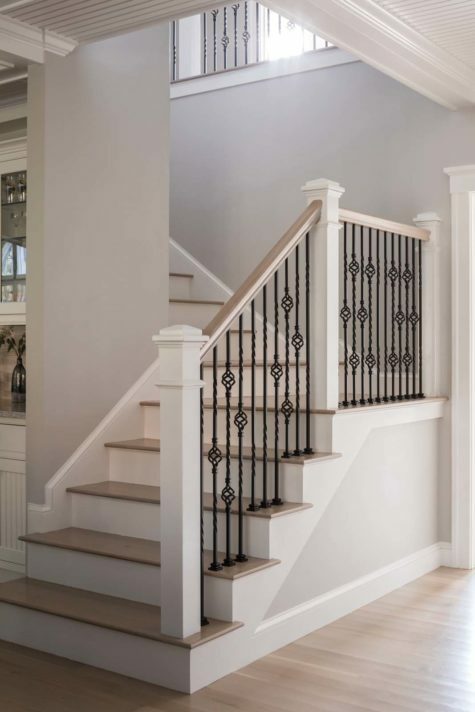 By way of contrast to the light palette, singlebasket iron balusters on the staircase “change up the white and gray,” says Josh. A navy and white indoor porch opening off the kitchen was an opportunity to go bolder with color. The porch extends to an outdoor deck, which has a grill built into custom mahogany cabinets that conceal a mini-fridge and utensil storage. From both the indoor porch and outdoor deck, the view is of the backyard trees and, behind that, a marsh, which is part of the Rachel Carson National Wildlife Refuge. For the kitchen, Judy says she liked the idea of “everyone milling around and casually talking.” To achieve this cozy ideal, the Jusseaumes worked with Karen Alcorn at Home Again by Hancock Lumber for the kitchen design. (Alcorn is also responsible for the bathroom design.) 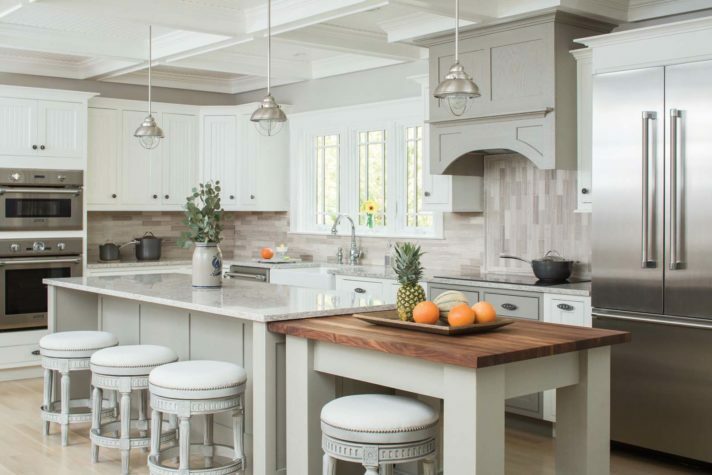 Opting out of a traditional kitchen table, the Jusseaumes chose to center the room around an oversized island with countertops at two different heights. Cambria quartz makes up the upper countertop, where the family gathers for meals, and the lower countertop, which serves as more of a workstation, is walnut. The perimeter cabinets (above the counter) and drawers (below the counter) are painted white with knobs and have pulls decorated with seashells, turtles, and starfish. The kitchen also has a wet bar with a built-in wine refrigerator, wine rack, and cabinets with glass doors. In addition to the cabinet hardware detailing, beach-inspired decorations are scattered throughout the house, with starfish in the dining room, wooden sandpipers on a table in the front entry, and a surfboard propped on a high shelf in the owners’ bedroom—a ledge that was formed when Richard Moody and Sons Construction ducted the gas fireplace that is set into a wall of craftsman– style paneling. “I am always cold,” says Judy, referring to her desire for a bedroom fireplace. “Sometimes we like to turn the heat off in the house and close the door and just be cozy in here,” she adds. The facade of the house makes use of black-framed windows with custom black mullions, some in the shape of elongated hexagons, others in the form of a starburst. At the rear of the house, a large arched window overlooks the wildlife refuge. This window fills almost all of one living room wall, and its arch visually references the arch that is used to define the space between the front entry hall and kitchen, and another arch that marks the transition between the kitchen and the living room. 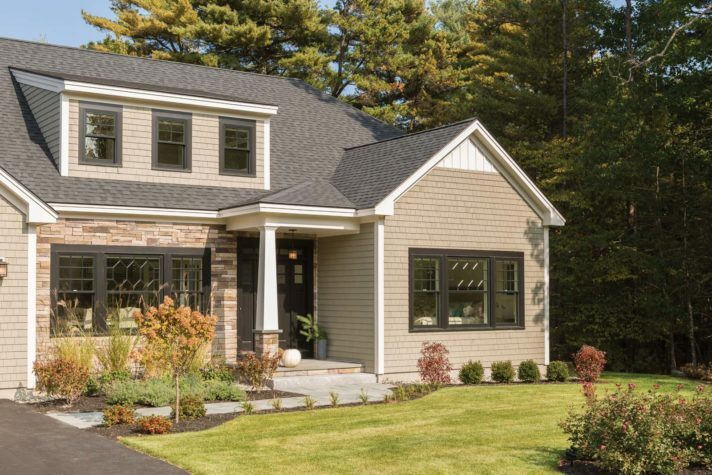 Like the interior, the white-cedar shingle exterior is intended to be subtle, focusing on natural materials and colors to allow the house to blend in with its surroundings. A bluestone path leads to a portico with a single tapered white column. To the left of the front door is a stone veneer accent wall. Its materials are echoed in the stacked stone fence that defines a long garden bed in the front of the house. More stacked stone appears in foundation walls that create two levels; the lower backyard is separated from the wildlife refuge by a white picket fence interwoven with beach plums. (Craig Alexander of Alexander’s Custom Stone and Landscape in Wells is responsible for the landscape design.) The house has a large front lawn and is located on a cul-desac, which belies how conveniently located it is to the summer pleasures associated with certain coastal tourist towns: clam shacks, a mini-golf range, and shopping. But for the Jusseaumes the real draw of the location was, and remains, the beach, which is walking distance from their house. Its name? Moody Beach. William B. Winkel Builder, Inc.